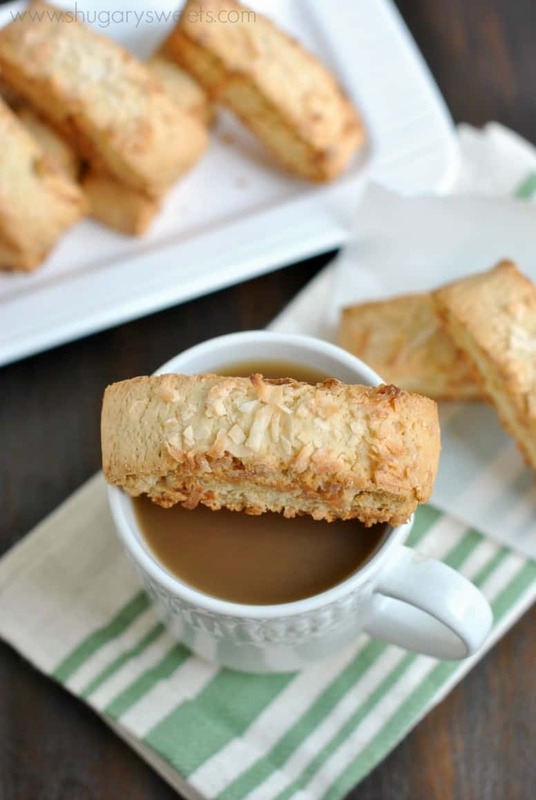 Sweet Coconut Biscotti is perfect with your breakfast this morning! Dunk it in your morning coffee or tea, and I say you have a well rounded breakfast! Ha! 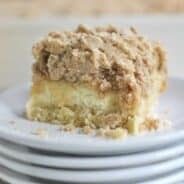 Have you ever been on a food blog and thought, oh man that looks good, I wish I could try it. Well, today, you have that opportunity. To try some of this sweet, crunchy, Coconut Biscotti. Want to know the details? It was before Christmas last year when my food blogger friend, Ashley made a big announcement. 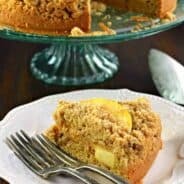 Ashley blogs over at Center Cut Cook and is always sharing some of the most delicious looking food! What was supposed to be the most wonderful news (a much awaited pregnancy with their first child) was also paired with some devastating news. Her husband Ryan was just diagnosed with stage 4 Colon Cancer. I’ve never met Ashley and Ryan, but through the food blogging world you get to “know” people. We are all on this crazy food roller coaster, all sharing each other’s recipes on facebook and pinterest. We are a community of like minded people, ya know? And when one of our peeps is in need, well, that’s when the “family” comes together to help. Today, is our day of help for Ashley and Ryan, and their new baby, Miles. Another mutual food friend, Carrie from Bakeaholic Mama is hosting a silent auction to help raise money for the family. This is where YOU can help! Head over to Bakeaholic Mama’s website today, and look at all the wonderful items up for auction. Things like…. Now, as for this biscotti, well, you know how much I love biscotti. I have been wanting to make a coconut version for quite some time! This was absolutely delicious, and perfectly sweet. Dunk it in your favorite coffee for a delicious breakfast. Go the extra step and whip up a batch of Almond Joy coffee creamer for some extra coconut flavor! In a large mixing bowl, beat butter and sugar until blended. Add eggs, beating until combined. Beat in flour and baking powder. Add coconut and coconut flavoring. Line a large baking sheet with parchment paper or silpat. Divide dough in half and shape each half into a 10inch by 2 1/2inch rectangle. Use your fingertips to pat evenly. Bake in a 350 degree oven for 25 minutes. Remove from oven and cool 5 minutes. Slice each rectangle into 10-12 biscotti. Turn biscotti slices onto a side. Return to oven and bake 8-10 minutes. Remove and flip biscotti to other side. Bake for an additional 8-10 minutes. Remove and cool. Store cooled biscotti in airtight container for up to two weeks. It’s great that you guys are doing this for #TeamRyan. I just bid on something myself over at Carrie’s site! These biscotti look unbelievably good. I imagine the coconut must go so well with coffee. Yum! I’m ready for one right now! These biscotti look amazing and I love the great cause. Definitely heading over and pinning. It’s great how everyone rallies to help people who need support. I love the idea of an auction! And your biscotti will go quickly. I can imagine that so many people are dying to try the food you’ve baked! A great cause AND some great biscotti? I love all the things about this post! Heading over the check these babies out! Pinned! I have somehow never made biscotti – that needs to change! This sounds amazing, and what a great cause. I am loving all the coconut in these biscotti! And dipping it in coffee…yes, please!!! 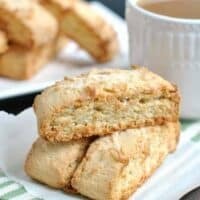 I have never had coconut biscotti and i LOVE the idea! The toasty coconut on top is like-mmmmmm!!! Oh wow these look amazing. I hadn’t heard about the auction either, what a great idea! Aimee the silent auction is a wonderful way to help your friends and spread awareness of a serious illness. I’m sure the family is incredibly thankful to have such lovely supportive friends like you and the other bloggers. 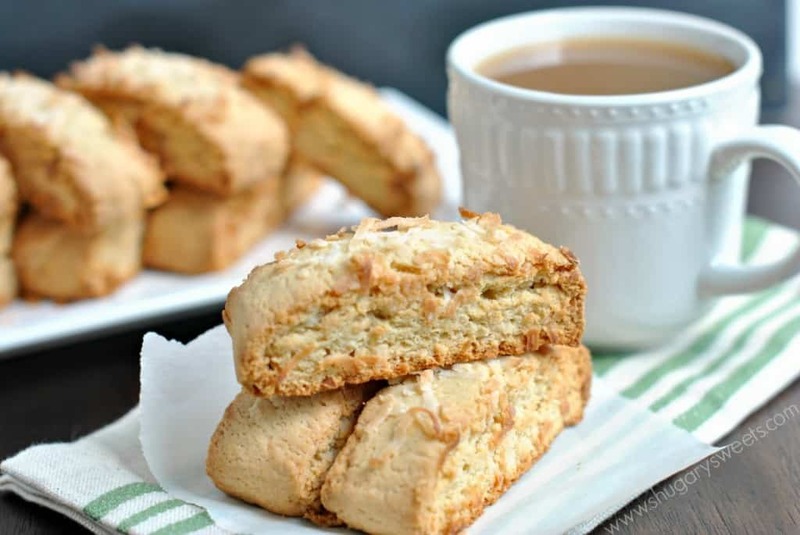 🙂 I’m going to head over now, but not before I bookmark this biscotti! 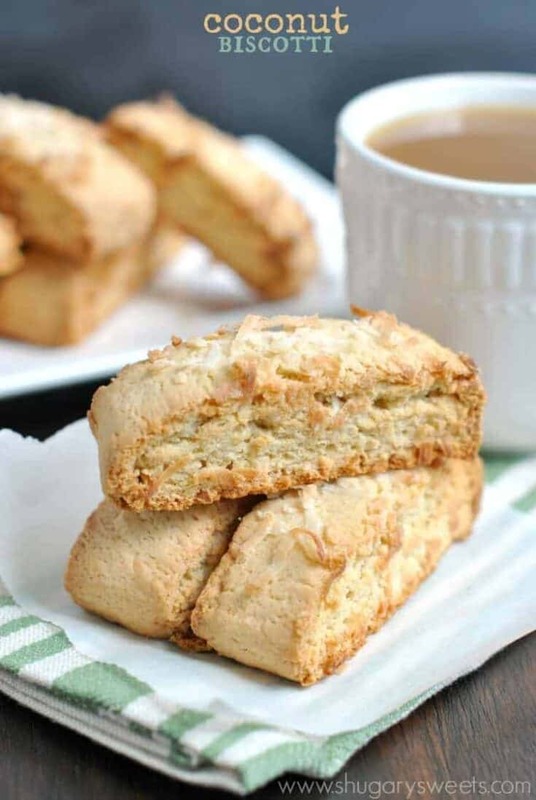 Thank you so much Aimee for sharing your Coconut Biscotti Recipe! I’m jusk baking them right now and I’m looking forward to taste them later. My house smells heavenly coconutly! I do want to ask you something, how do you achieve that some shredded coconut pastes to the top of the biscotti? In your recipe you dont indicate that after giving shape to the dough we must sprinkle some coconut, but I did. Nevertheless after the first bake and when cutting them all that top coconut felt down. So, what is your secret to paste it? Thank you so much!! I don’t do anything to get those coconut flakes. They just appeared. Some batches had more showing than others 🙂 Enjoy the biscotti!! 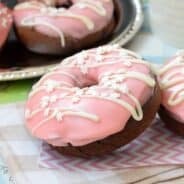 Hi these were delicious and i wanted to make them for a friend but she is dairy free ..do you think i can substitute the butter for coconut oil or something else ? Can you please help me to convert into metric (gm) for butter, sugar and flour? Thank you.